Who’s Guilty for the Holocaust? Joseph Parry addresses the idea of collective guilt in the aftermath of the Holocaust in a recent installment of the Philosophy Lecture Series. PROVO, Utah (Sept. 15 2016)—In a recent lecture Philosophy Department chair Joseph D. Parry said, “There’s a feeling of dissatisfaction that is growing in me in how we’ve conceptualized the people, individually and collectively, involved [in the actions of the Nazis].” He explained that this dissatisfaction came from his belief that when it comes to the Holocaust, we have an incomplete and crude understanding of guilt and who is guilty in collaborating with or allowing Nazi atrocities. “It takes a lot of people to carry off a Holocaust,” Parry said. Along with the soldiers who would have told their families of their traumatic experiences, there were office workers, railroad workers and a large number of people, including 500,000 German women, who went to the Nazi occupied territories of Eastern Europe to seek better economic opportunities than they could find in Germany itself. These people would have known that there were people being cleared out of the cities to be massacred. Parry explained that the Nazi murder of the Jews was horrific, but it wasn’t only the Jews who were discriminated against in Nazi Germany. “Hitler saw Judaism as anything antithetical to Germanism. Whether it was communists or western capitalists, it was Jewish conspiracy,” he said. The belief that all non-ideal people are associated with the Jews is called Judeo Bolshevism. The adoption of Judeo Bolshevism led to the tragic deaths of many non-Jewish people. “The first group that fell under the Nazis’ target were communists,” he said. 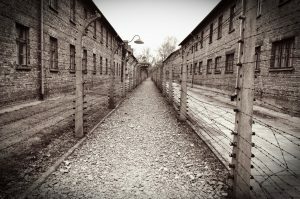 “They were rounded up and put in camps.” These concentration camps were sometimes used as a place to educate people in Nazism, but were more often places of torture and brutal treatment for those who fell outside of the Nazis’ Aryan ideal. Other groups affected by Nazi nationalism included Slavs, homosexual, Jehovah’s Witnesses, gypsies and children with disabilities. The “sticky question” as Parry describes it, is that of moral culpability. “The question becomes to what extent people were doing things for survival that if they didn’t comply with, they would be thrown into concentration camps,” he commented. Parry explained that the German people certainly lived under threat, but the level or type of threat can be misconceptualized. There is also, Parry continued, a sort of survivor’s guilt, what Jaspers titles “metaphysical guilt” which is “a lack of solidarity with the human being as such.” Metaphysical guilt comes from not doing everything possible to stop atrocities from happening. This guilt, Parry said, is something that we see in the German people after the war. There might have been good reasons that they did not sacrifice themselves, but they still act as if they are guilty. Hannah covers events for the Philosophy Department for the College of Humanities. She is a junior pursuing a degree in art history with a minor in art.